Nokia 1 review - is this the best low-end phone ever? It isn't fair to compare this device with phones that cost twice as much and it is certainly not fair to compare it with phones costing almost ten times as much. The real question is this: Is it usable as a daily driver? And the answer is yes, although if you can spare just a little more, the Nokia 3 is a much better buy. By this point, it is safe to declare Nokia’s comeback a success. While there are no guarantees in this business, if Nokia sticks to its plan, it will keep gaining market share. One part of that plan is to offer an Android phone for every price range. The Nokia 8 and Nokia 7 Plus live at the high end, with their Snapdragon processors and at least 4GB of RAM. In the middle, Nokia offers devices like the Nokia 3 and Nokia 5, with less RAM and lower performance processors, but still at least 720p HD displays and Corning Gorilla Glass. Nokia’s naming strategy is simple but effective. The higher the number, the better the device. At the low-end is the Nokia 1, the company’s best attempt at an ultra-affordable Android smartphone. 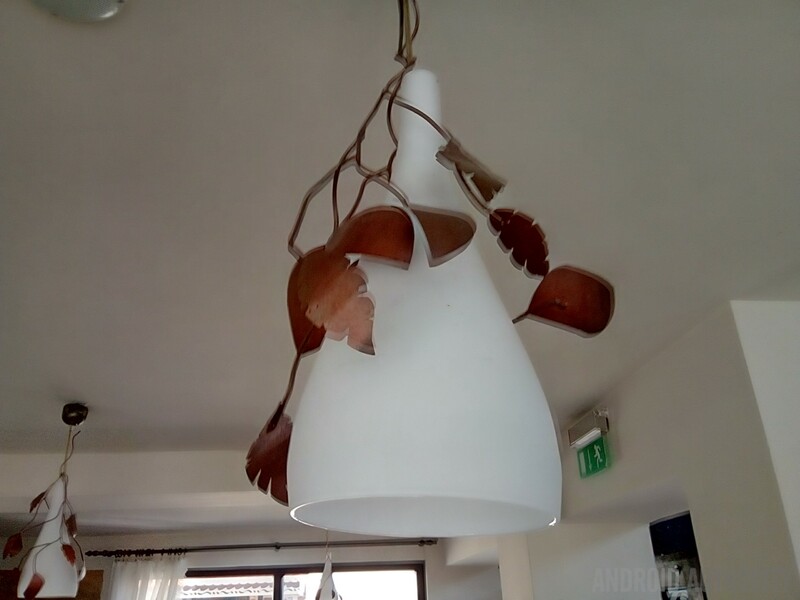 The question is, is it usable? Find out in our Nokia 1 review. The Nokia 1 is small. It has a 4.5-inch display and a body size to match. To keep costs low, the Nokia 1 needs to be very easy to build, and as such doesn’t try to deliver ultra-thin bezels or save much space. Everything is plastic (I am not even convinced it has a glass front). The back cover is removable though and Nokia sells a line of Xpress-on covers. 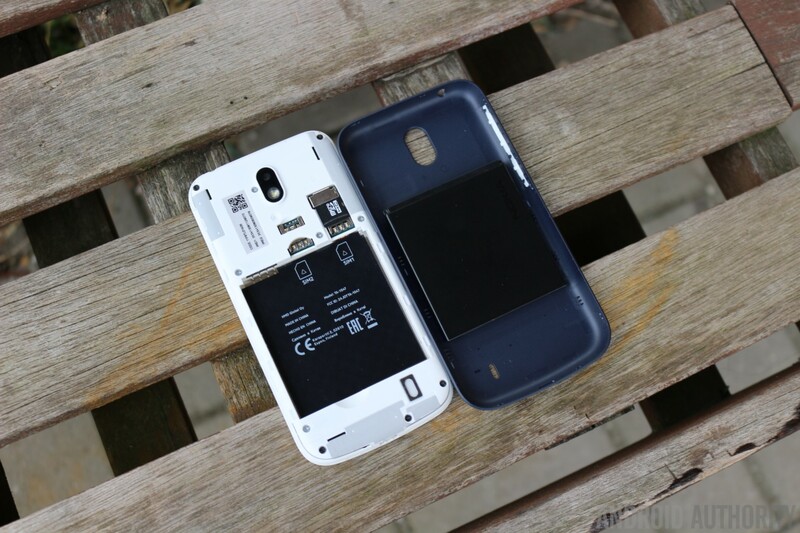 Under the cover, you will find a replaceable battery, two nano-SIM slots, and a microSD card slot. 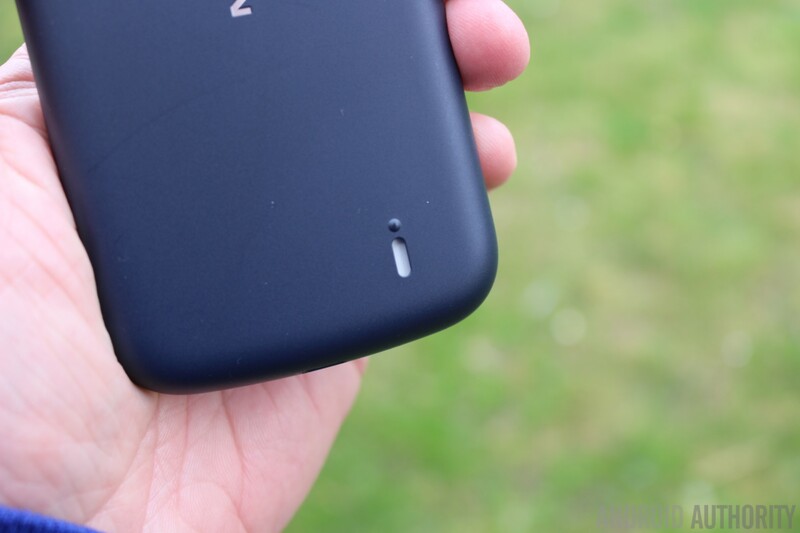 The power button and the volume rocker are on the right of the device and are part of the Xpress-on cover. It’s got a 3.5mm headphone jack on top and a Micro-USB port on the bottom. On the back is the camera and flash, along with a speaker. Above the display, you’ll find the front-facing camera, a light sensor, and the phone’s earpiece. Below the display is the microphone. The design is simple and clean. Plastic, but not cheap. Old-school, yet somehow modern. The Nokia 1 comes with a 4.5-inch 480 x 854 display. It makes the phone feel like something from 2011, when all phones used to have this kind of screen resolution. Nokia naturally wants to make this device easy to assemble, therefore no difficult manufacturing techniques were used to reduce the bezel sizes. As such, the Nokia 1 has a 60 percent screen-to-body ratio. The display is decently bright — it is great indoors, works OK outdoors, but struggles in strong sunlight. The phone uses an IPS LCD display, so it has good viewing angles and reasonable color reproduction. 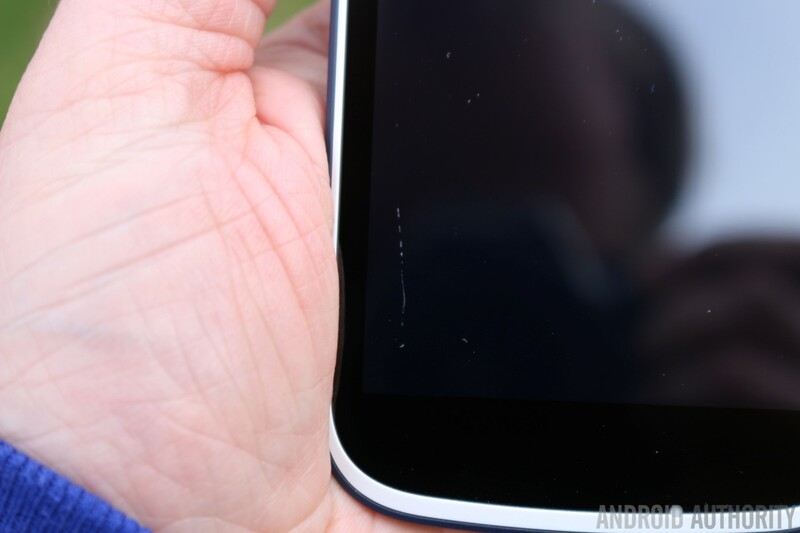 Unfortunately, the Nokia 1 doesn’t sport any kind of toughened glass. During an outdoor photo shoot, I put the phone down on a tiled surface, which had some sand on it. When I picked it up, the sand had scratched the plastic protecting the display. If the criteria is quality, crispness, and vibrant colors, the display on Nokia 1 fails compared to even slightly more expensive phones. If the criteria is usability at a low price point, the display is excellent. It’s not going to win any awards or compete with devices like the Nokia 8, but it gets the job done. It’s hardly the worst display I have ever seen on an Android phone. The Nokia 1 packs a MediaTek MT6737M, which is a quad-core Cortex-A53 processor running at 1.1GHz. It is coupled with a Mali-T720 GPU and 1GB of RAM. 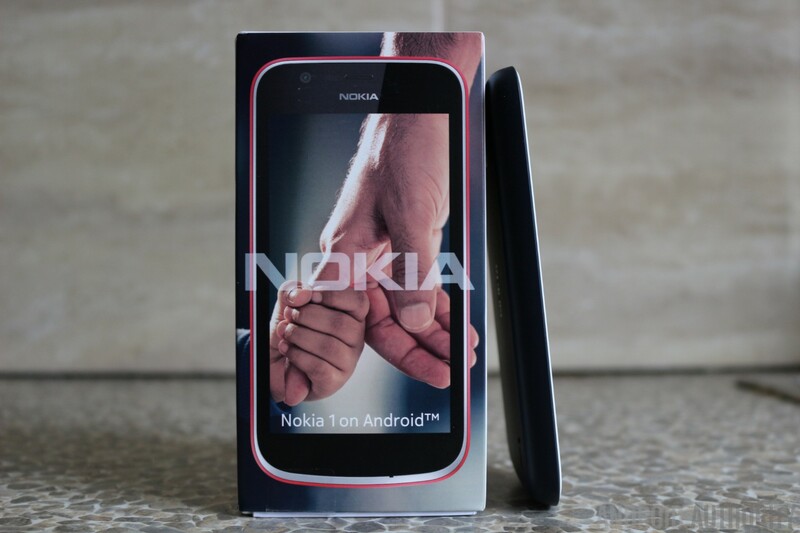 While the Cortex-A53 is a 64-bit CPU, the Nokia 1 seems to run a 32-bit version of Android. Benchmarking the Nokia 1 won’t tell us anything — the key here is usability. Will you be screaming at the phone and wanting to throw it across the room because it feels slow and doesn’t respond when you tap on the screen? Thankfully the answer is no. If you keep your expectations simple and work with the device, rather than against it, it is usable. At times it’s even a joy. However, if you ask too much of it, you will become frustrated. Nokia's naming strategy is simple but effective. The higher the number, the better the device. The Nokia 1 review unit came with 8GB of internal storage, half of which is used by the Android OS and the pre-installed apps. That means you get around 4GB of free space for apps, music and photos. Thankfully you can add additional storage via the microSD card slot, which supports capacities up to 128GB. Android Go is particularly well suited to using additional storage and makes moving apps and data over to the SD card a breeze (more on that later). The phone supports 2G, 3G, and 4G LTE across a variety of frequencies depending on your location. I used the European model, which is also dual-SIM. You can use 4G on either slot, but once you have established which card you will be using for data, the other slot is switched to 2G GSM mode only, even if it is 4G compatible. This is fairly normal for dual-SIM phones, but still worth noting. Because the Nokia 1 doesn’t use a SIM tray, it is possible to use two SIM cards and a microSD card all at the same time! The Nokia 1 review unit’s built-in speaker is screechy and lacks depth. The sound reproduction on headphones is reasonable, but lacks a little clarity and is weaker in the lower tones. There is also a “BesLoudness” option for the external speaker. I am not totally sure what it is meant to achieve. After switching it on and off a few times, I think I prefer it off. You won’t get much from the external speaker either way, so stick with using headphones. The Nokia 1 has a 2,150mAh removable battery, which should see you through the whole day. For mixed activities like surfing the web, watching videos, making calls and playing 3D games you will get between six to seven hours of screen-on time. For less taxing tasks like web browsing or just watching video, it can reach up to seven or eight hours. The phone uses an IPS LCD display, so it has good viewing angles and reasonable color reproduction. The phone doesn’t support any kind of fast charging. Charging from 10 to 100 percent takes three hours and 45 minutes. The last 20 percent took an hour. In the box, you get your Nokia 1, some earbuds (the plastic type without rubber or foam tips), a 1A charger, and a micro-USB cable. The Nokia 1 runs Android 8.1 Oreo (Go edition). It’s a vanilla Android experience with access to Google’s apps and services like the Play Store, Gmail, and YouTube. The Go edition is a special version of Android tuned and tweaked to run well on low-end devices. There are also Go versions of key apps like Gmail, Assistant, and Maps. This is what keeps 4GB of the internal storage free for your data. For reference, the Samsung Galaxy Note 8 uses 11GB of its internal storage just for Android and pre-installed apps! There is also an emphasis on data saving. Many people who buy low-end phones also have limited data plans. For example, you can activate the data saving features of Chrome which will route your internet traffic via Google’s servers for compression before being sent to your device. Files Go also has a way to share files with Wi-Fi via a peer-to-peer service. The bundled version of the Google Play Store has also been tweaked to highlight Go versions of apps, while still offering its entire app catalog. The pre-installed version of Gmail is Gmail Go, but you can still find and download the standard version of Gmail if you so choose. Likewise, Google Play will mention if a Go version is available when looking for apps. When you insert a new microSD card, Android Go offers you the choice of using it as “portable storage,” meaning you can take it out of your phone and use it with another phone or computer to transfer files. You can also use it as “internal storage,” which means it will be reformatted and only work in your device. 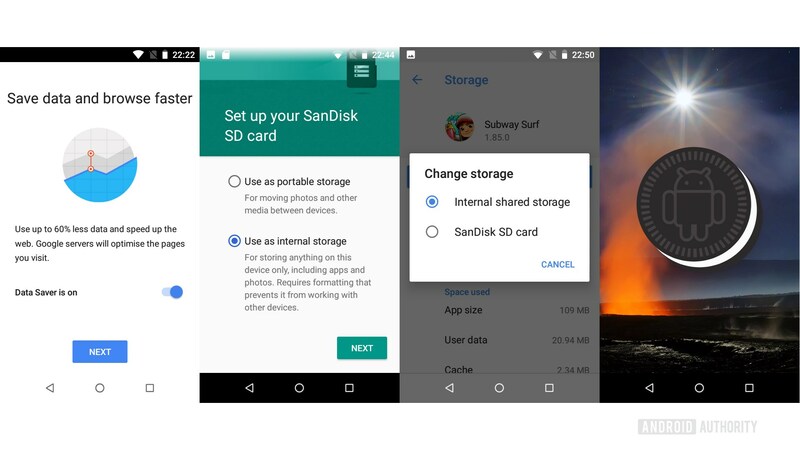 Selecting “internal storage” allows you to move apps and data onto the SD card as if it was just part of the normal internal storage. For the Nokia 1 review, I was able to install a game like Subway Surfers from the Play Store and move it to the SD card without any problem. This should ease the pressure of having just 4GB of free space. The pre-installed version of Gmail is Gmail Go, but you can still find and download the standard version of Gmail. Unlike vanilla Android on devices like the Pixel 2, Android Go isn’t supplied directly by Google. It is built by Nokia from Google’s sources. This means there is going to be an inevitable delay when receiving security updates. First, Google publishes new security patches and releases them for its own devices and Android One devices. Then, Nokia takes those patches and rolls them into whatever updates it pushes out for the Nokia 1. As a result, my Nokia 1 review unit still only had January’s security patch in April. 5MP on the rear, 2MP on the front. I could stop there. By reading the specs — and considering the price point — you know this isn’t going to be an earth-shattering shooter. 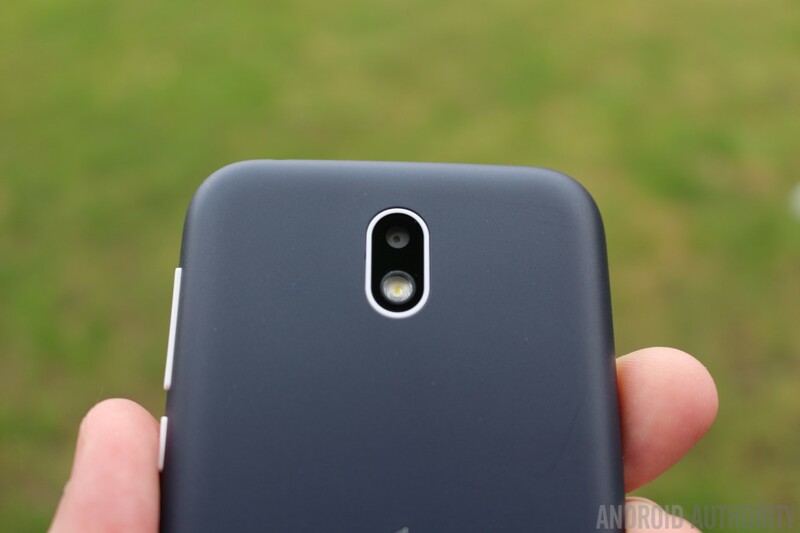 For the Nokia 1 review, the camera at least met my expectations — it wasn’t worse! The included camera app is simple, but fully functional. You can take pictures and record video capped at 720p HD. The app doesn’t include many special modes, but it offers a panorama option and some rudimentary manual controls. Overall it is just a basic point-and-click camera app. The camera had an issue with ghosting. A lot of my early photos seemed to contain two images, like camera shake, but better defined. I don’t know if it was the HDR settings or a slow response from the camera, but the only way to rid myself of these blurred images was to make sure I stayed very still for one or two seconds after tapping the shutter button. 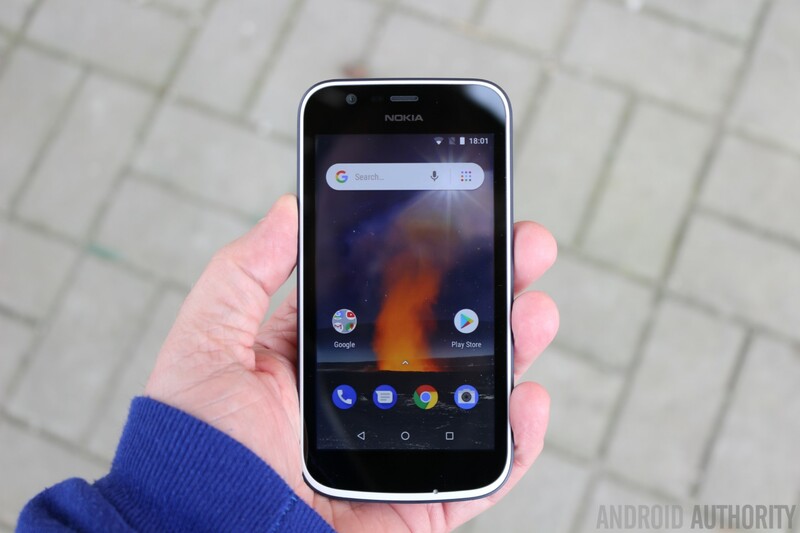 The Nokia 1 is an inexpensive Android smartphone, and as you can tell from the Nokia 1 review, you very much get what you pay for. If you have a bit more extra cash, I would suggest getting the Nokia 3. If your budget doesn’t stretch that far, the Nokia 1 is still a good choice. The device is definitely usable; you can check your email, use social media, and even play games. Even at $100, it’s important to remember the phone’s limitations. The screen is small with low resolution. The processor has limited performance. The cameras leave a lot to be desired. The Nokia 1 is probably the best low-end phone you can get, but for just a little bit more cash you can get other Nokia devices with better specs and performance. 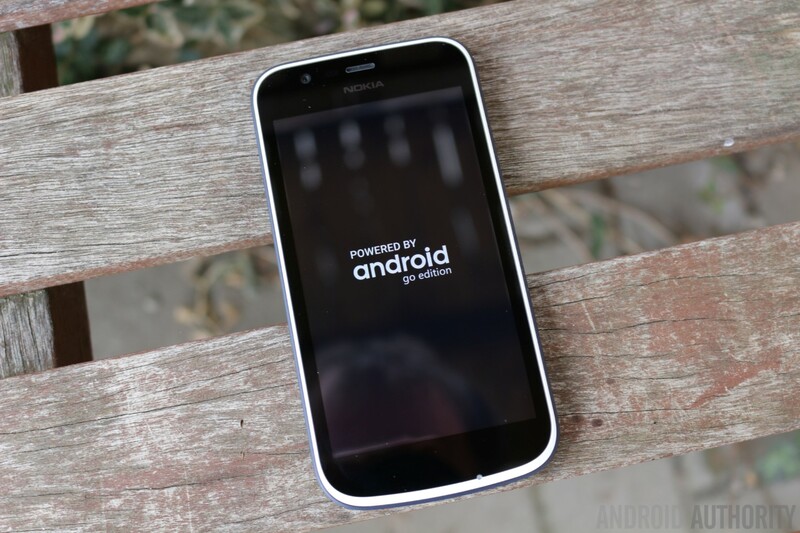 What do you think about our Nokia 1 review? Let us know in the comments below!